I started a guild in 2002. We first met at our library, outgrew our space and moved to our community center. Upon opening my shop in 2006, I had to discontinue the guild meetings due to teaching Continuing Ed Evening Programs in Salem and Derry. AKG has always been a full service shop with Private and Individual daytime classes from Wednesday through Saturday. I am always adding new products and items. Please, stop by or give a call with any questions or for more information. My parents raised us to believe in charity work, giving to others helps us to become better people in many ways, seen and unseen. We are involved in our Charities donating to 'Neighbors Helping Newborns' and The Upper Room in Derry, N.H., two very special organizations I hold close to my heart. 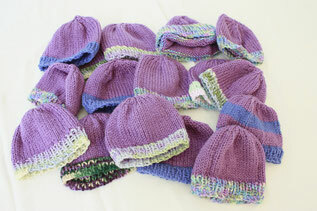 Both accept knit/crochet hats and mittens. Neighbors Helping Newborns distributes many items, the list to long to print here knit/crochet/quilted. Layettes are presented to many hospitals and pregnancy centers in the local area. The Upper Room's mission is to create a strong, vibrant and self sustaining community where conflict and hunger, homelessness and poverty, and ignorance and and intolerance no longer exist. For more information on information on either, stop by for their brochure. AKG is their local drop off point!